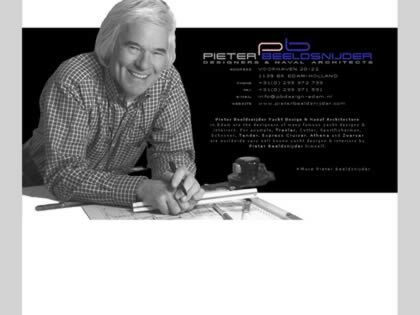 Pieter Beeldsnijder Yachts Designer & Naval Architecture in Edam are the designers of many famous yacht designs. For example, Trawler, Cutter, Sportfisherman, Schooner, Tender, Express Cruiser, and Zwerver are worldwide very well known yacht designs by Pieter Beeldsnijder himself. Web Site Snapshot: If available, above is a snapshot of the Pieter Beeldsnijder Yachts Designer & Naval Architecture Edam web site at http://www.pieterbeeldsnijder.nl as it appeared when this site was added to the directory or last verified. Please Note that Boat Design Net has no involvement with the above web site; all content and images depicted in the above thumbnail are the property and copyright of Pieter Beeldsnijder Yachts Designer & Naval Architecture Edam unless otherwise noted on that site. Description: Pieter Beeldsnijder Yachts Designer & Naval Architecture in Edam are the designers of many famous yacht designs. For example, Trawler, Cutter, Sportfisherman, Schooner, Tender, Express Cruiser, and Zwerver are worldwide very well known yacht designs by Pieter Beeldsnijder himself.